By John F. McKenna (McJack): Unbeaten 23 year old British and Commonwealth heavyweight champion Tyson Fury (16-0, 11 KO’s) has openly acknowledged that he is not ready to face the Klitschko’s. In an interview with The Daily Mirror Fury said that he needs five or six fights before taking on either Vitali or Wladimir Klitschko, who have expressed an interest in the past in fighting the 6’9” inch 255 pound Fury. Many British boxing fans are hopeful that Tyson will fill the void left by David Haye, who announced his retirement on his 31st birthday on October 13. Fury’s size is roughly equivalent to the 6’7 ½” WBC heavyweight champion Vitali Klitschko, but as defeated challenger Tomasz Adamek stated after his one sided loss to “Dr. Ironfist” on September 10, he would have lost even if Vitali was 5” shorter. Tyson would have a size advantage over the 6’6” The Ring, (Super) WBA, IBF, WBO and IBO heavyweight champion Wladimir Klitschko but presently he is nowhere near Wladimir’s skill level. 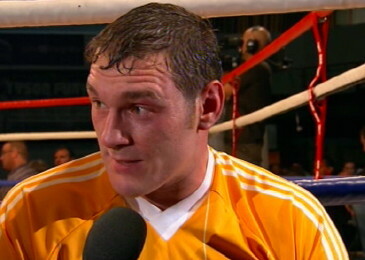 “It would be quite easy for me to go and get a fight with Vladimir in Germany. But I’m only a baby in heavyweight terms. I’m the British and Commonwealth champion, I’m undefeated in 16 fights, but I don’t need that fight right now. “Maybe in five or six fights’ time, if they want to do it, then fine. But I’m not going to Germany now, because in another five fights I’ll be a hot property and they will have to come over here and fight me. What would be the point in me fighting them now for a quick pay day? It’s not about money for me, it’s about achieving. “I’m not going to rush in there until I’m ready and get beat. Because once my “O” is gone, it’s gone. I’m going to take it steady at my own pace. I don’t need the money, I’ve food in the cupboard, I can put diesel in the car and I can go to the movies. I’m living the dream and I want to live it as long as I can. Fury will defend his British and Commonwealth titles against undefeated Canadian Neven Pajkic (16-0, 5 KO’s) at Manchester’s Event City on November 12. In Fury’s last fight on September 17 he scored a 5th round TKO win over American journeyman Nicolai Firtha (20-9, 8 KO’s). Prior to his win over Firtha, Tyson won a unanimous12 round decision over Dereck Chisora (14-1, 9 KO’s) on July 23 picking up his British and Commonwealth title belts.